Hair Stylists can sometimes be guilty of glossing over the facts and overselling the benefits of hair colour services, perhaps because as they are under pressure to hit financial targets or maybe they just want to do their best to make you happy. At Tribe, our Stylists have a different approach, where we will always be realistic with you about what can be achieved and do what’s best for you and your hair. Here are some honest truths about hair colour that we think you should know.. The results that can be achieved with bleach are incredible, however lifting your hair to a lighter shade is a delicate process and should always be approached with great care. Even with our amazing Aveda Enlightener (Aveda’s version of Bleach), we are still opening up and lifting out the natural (and sometimes artificial) pigments in your hair, there’s no getting around the fact that it will change the condition. Our Stylists will know how far your hair can be pushed without compromising the condition too much, but there other factors (such as lifestyle & styling routines) that when considered, may determine that you’re hair isn’t suitable for bleaching. Whilst it’s true that different styles, shades and applications of colour can vary in amount of maintenance needed, all colours require ongoing care to keep your hair looking it’s best. When deciding on which look you want to achieve, it’s important to discuss with your Stylist, the longer term commitment of the colour. Hair colour is more than just the cost of your in-salon appointment, you’ll also need to factor in the ongoing costs of any necessary follow up appointments, products and treatments. Higher end colour products (such as Aveda Colour) have less harmful, more conditioning ingredients in them, but your hair will still need help after using them. To protect your hair from the impact of hair colouring, premium Shampoo & Conditioning products are needed to minimise colour fading and prevent any ongoing deterioration in the health of your hair. 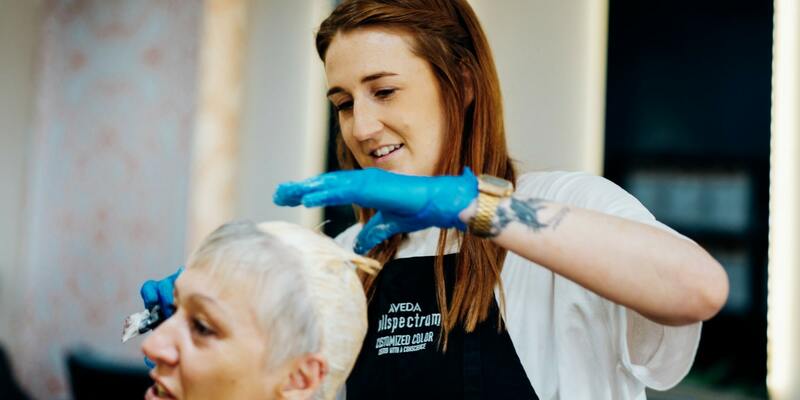 It may also be wise to invest in other conditioning treatments (such as Olaplex) in-between colour services, to rebuild your hair and maintain it’s best possible condition. I know it may seem like they are, but Hair Stylists are not magicians. The key to making the right choice and achieving an amazing hair colour is the information you can give them. Don’t be afraid or embarrassed to be completely honest with your Stylist (and yourself). A good stylist will not judge you, they’ll help you find the best possible look for you based on all the relevant factors such as your hair, personality, lifestyle and budget. They’ll also need to know the history of your hair including; previous colour, how much heat is applied to the hair when styling, how often you swim, the products you regularly use etc. Be honest and help them help you. A good Stylist will always prioritise the condition of your hair and suitability over the desired shade, after-all, what’s be the point of having ‘ice white hair’ if it looks damaged, frizzy and doesn’t compliment your skin tone. It’s unfair to put pressure on your Stylist to try and achieve something that they don’t feel is realistic or suitable. It may sometimes feel like they are being difficult or uncompromising, but remember, you’ll be a walking advertisement of their work and their reputation is at stake. It may be want you want to achieve is possible, but not straight away. You’ll see the benefits of a long term approach as your stylist works towards your desired colour whilst keeping the integrity of your hair.